Buy & sell quality used goods. Upgrade to a newer used model and save! With great rates starting as low as 3%! For when it seemed like a good idea at the time. Trade in, trade up, buy, sell or pawn. We buy them, we sell them. We've Been Serving The Brampton Area Since 2000! We are your neighbourhood destination for quality used goods, including gold, jewellery, electronics and more. We buy, sell, pawn and trade in second hand goods. Additionally, our location is conveniently accessible for payday loan alternatives. Our team of experienced buyers will provide you with a personal consultation to ensure you get top dollar for your items. We all benefit from buying and selling second-hand goods. The buyer wins if the purchase price is lower than the same item bought new. The seller wins by selling unwanted used goods instead of discarding them. The environment wins because recycling goods through the used marketplace both lowers use of manufacturing resources for new goods as well as reduces waste which must be disposed of. Finally, the fact remains that many quality used goods can be more durable than newly manufactured goods. Why get payday loans when our rates start as low as 3%. 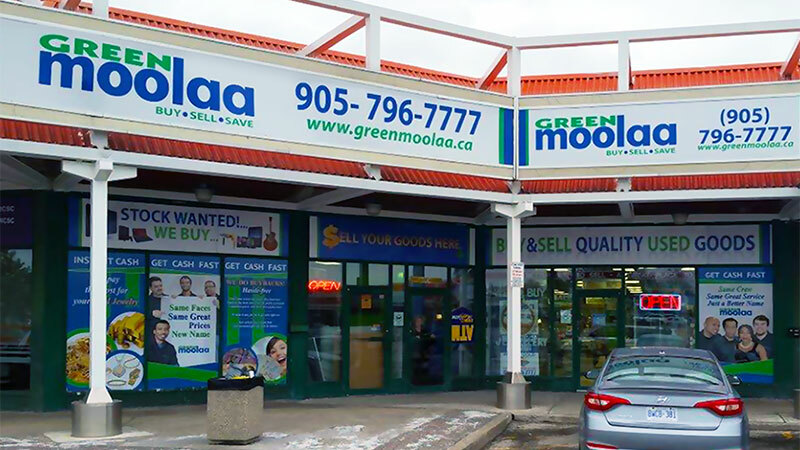 At Green Moolaa, we understand that everyone needs some extra funding from time to time. It's important to be smart when looking at your funding options. Payday loans may seem like a quick fix, however, they can be a financial pitfall with an extensive list of long-term disadvantages. Trading & Consignment is simply an arrangement whereby goods are left with Green Moolaa to sell. We then receive a percentage of the sale. Consignment arrangements typically are in effect for a set period of time. If the goods have not sold after this period, the goods are returned to you, the owner, or are left with Green Moolaa for an additional consignment period. When the item is sold, 70% of profits are all yours! Selling on consignment is a great option for customers who do not have the time or space to sell items themselves.